LOCAL people have been praised for making the most of the opportunity they were given last week to have their say on the future development of Delamont Country Park, outside Killyleagh. Newry, Mourne and Down Council organised a special event at the park’s Heron’s Nest last Thursday so those who live near or use the country park could outline what attractions should be developed to make the leading tourist facility even better. The special -in session was part of the local authority’s commitment to develop a new masterplan for the 200-acre country park located on the shores of Strangford Lough which already attracts tens of thousands of visitors every year. Council officials have appointed consultants to help transform the park over the next decade and want local people to have their say. Local councillors Billy Walker, Terry Andrews and Cadogan Enright have praised those who took part in the public consultation which looked at all aspects of the park, including its resources and facilities to make one of the best even better. The trio also used last week’s event to call for East Down to be re-established as the centre of a network of off-road community trails that would be both regionally and nationally significant. They have submitted a detailed plan to restore linkages that were lost in the 1980s and 1990s that led to the loss of the Ulster Way linking Killyleagh with the country park and Downpatrick. The politicians say the loss of section between Killyleagh and Downpatrick and on to Strangford was a “huge blow to East Down”. Cllr Enright said that while local council officials have promised to re-assert off-load links to recreate a key part of the Ulster Way, the project has not been prioritised. To move the issue forward, a motion will be tabled at next month’s meeting of the local authority, seeking cross-party support for three council departments to get involved with the project to re-establish a network of community trails. The local politicians want the policy and resources department and its legal team to ensure off-road links are restored, enforced and maintained, with the active and healthy community department asked to target key routes for community trails between Kilclief, Strangford, Saul, Killyleagh and Downpatrick to ensure the area has an off-road network worthy of being adopted as a way-marked trail. In addition, the council’s enterprise, regeneration and tourism department is being asked to strategically link up the community trails to way-marked trails on a regional basis. The local councillors say Newry, Mourne and Down Council must also apply to have the local section of the Lecale Way recognised once again as part of the Ulster Way, stretching all the way to Killyleagh, around the southern banks of Strangford Lough and across the Quoile River. “We will be approaching council chairman, Mark Murnin, to take this motion though on a cross-party basis as a priority project. 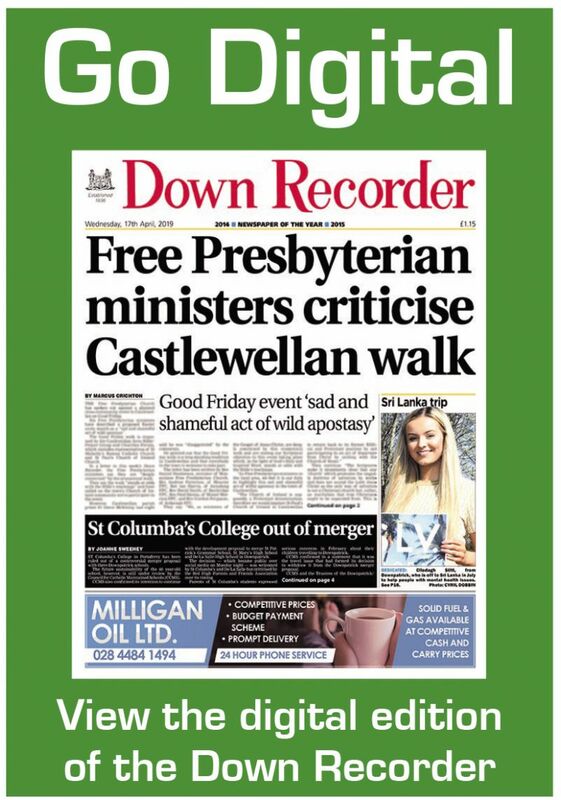 It is clear that the objective of restoring the Ulster Way to Downpatrick and Rowallane has been on the organisation’s ‘to-do’ list for far too long. Now is the time for action,” added Cllr Enright. Cllr Walker said councillors now need to ensure that what he described as this “vital project” is prioritised on a cross-departmental basis to have any hope of success within a reasonable timescale. “It is vitally important three separate council departments get involved moving forward. Delamont Country Park offers huge potential and re-establishing a network of community trails is an exciting proposal which we hope will come to fruition,” he said. Cllr Andrews said he was pleased to take part in last week’s consultation and was impressed at how many people took the time to attend, confirming he will be supporting the motion and views outdoor leisure as an economic driver for the whole region. “The people who attended last week’s event agree that the country park is a major tourism asset and offers significant development potential which must be appropriate and not spoil what is already in place,” he continued.